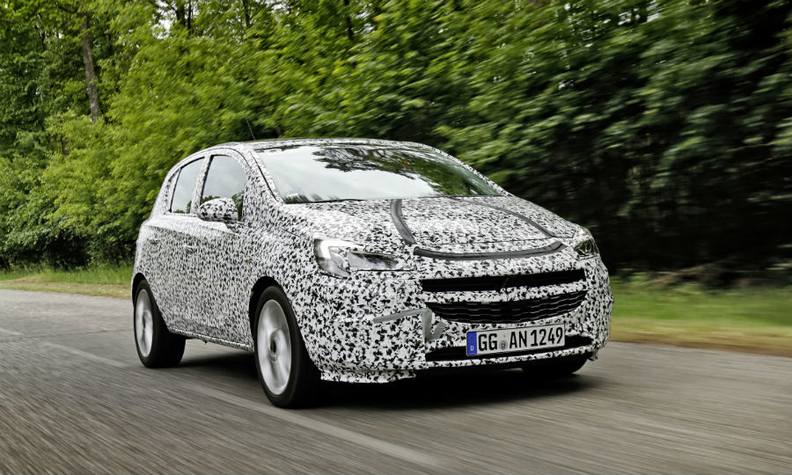 Opel has released pictures of a camouflaged new Corsa undergoing final validation drives. MUNICH -- Opel said a new version of the Corsa subcompact with upgraded infotainment and fuel-efficient engines will arrive in European showrooms at the end of this year. The new Corsa will have an upgraded infotainment and navigation system which offers wireless Internet access, as well as a range of economical engines including a new-generation 1.0-liter gasoline engine and a new six-speed manual transmission. Opel also said in a statement that the Corsa has a newly developed chassis and improved steering. Subcompacts cars are the most popular segment in Europe, but Opel has been producing the current version of the Corsa since 2006, resulting in a sales drop as rivals have introduced newer products. Corsa sales in Europe fell more than 10 percent in 2012, and 8 percent in 2013 as rivals including Ford, Renault and Citroen refreshed their model ranges. Opel has made losses for years, hampered by management shake-ups and an aging model range that have led market share in Europe to drop to about 7 percent today from more than 10 percent a decade ago. By 2022, Opel and UK-based sister brand Vauxhall want to become No. 2 in the European passenger car market boosted by a product and marketing push.